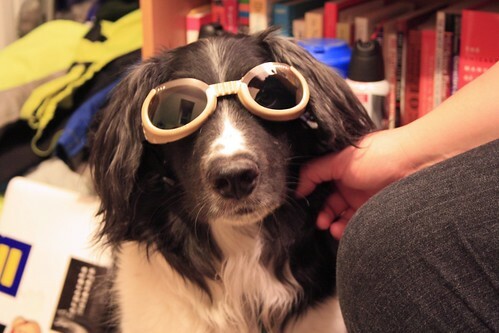 Introducing the Dogs… to Doggles! For our next “big” trip, we want to do a RTW with the dogs. That’s why we bought the Ural – hopefully both dogs will fit comfortably in the sidecar or we may have to buy a second Ural – but we’ve been slowly stocking up on gear for the dogs and trying to address the unique travel challenges of having the dogs ride in a sidecar rig. 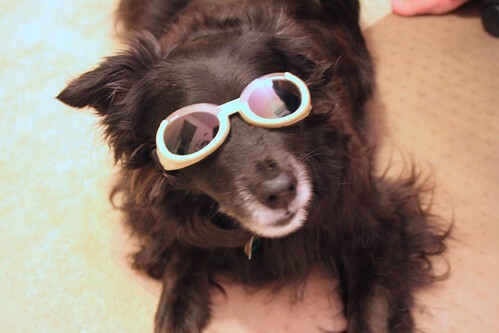 And one thing that many owners agree on is: Doggles! So! The day the Doggles came, we sat down with the dogs and a metric crap-ton of treats (yes, that’s an official measurement) to try to coax the dogs to wear them, and make sure they associate wearing the Doggles with positive things. 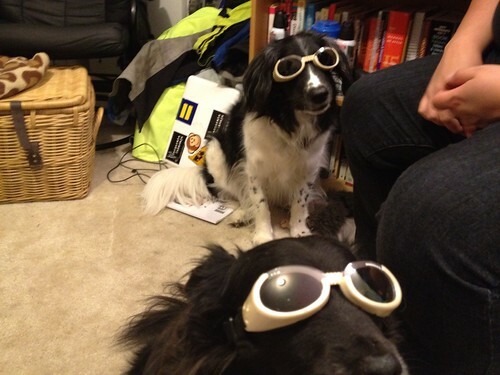 For your viewing pleasure, may I introduce: the Doggles! How did it go, you may ask? Well. They say a picture is worth a thousand words. How many words is video worth?